These lazy lions hardly gave us the time of day, but they were lounging conveniently close to the fence to be great for observation. Talk about a freakishly large cat! A grizzly bear seems a much more “blunt” danger when compared to a cat. Cats just LOOK a lot smarter, like they might nonchalantly stalk you for pleasure, then toy with you as if you’re a mouse. Milo had absolutely no sense of fear with these guys though. Jeremiah went hunting last weekend, so Milo and I met a friend at the Zoo, a “safari-style” walk through of mainly large African animals. 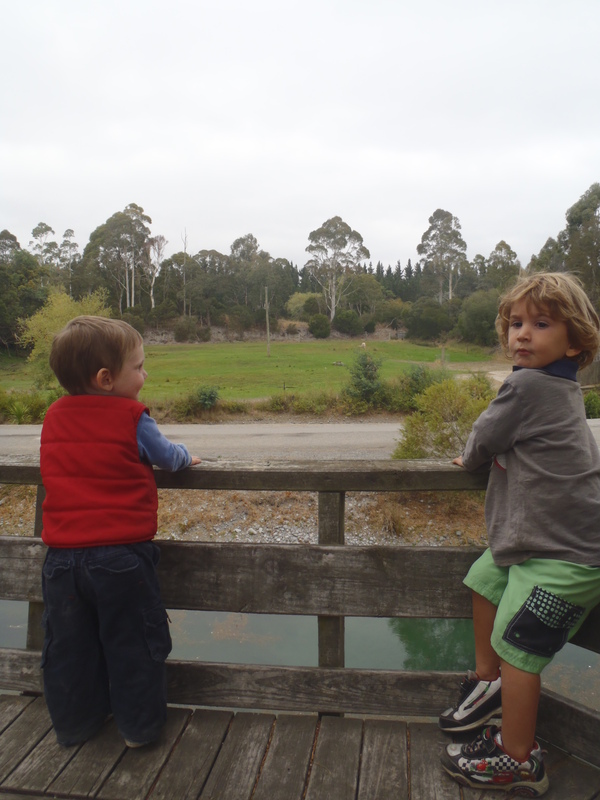 Tristan and Milo are looking at the giraffes from afar, but earlier we had been quite close to them. With their wide heads atop long agile necks they reminded me of dinosaurs.